The Shapiros Take an Adventure: Winter Break! I suppose this is my first "real" post of the year! I should think that we are all recovered from any New Year's Eve partying - we certainly took it easy, so there wasn't much to recover! Bowl! 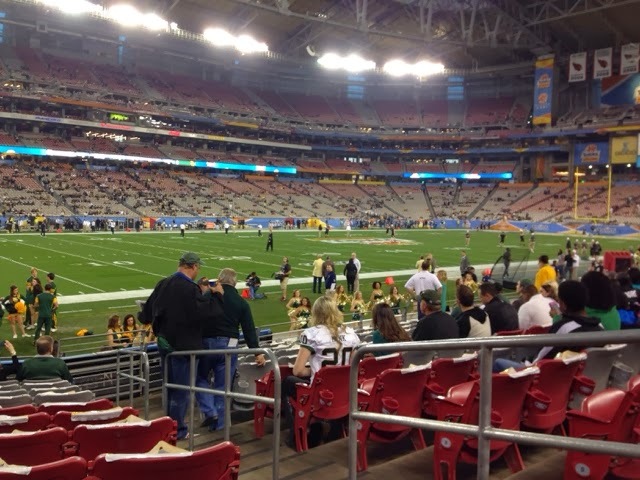 Even though we didn't have a particular connection to either school playing (Baylor and Central Florida), we still thought it would be fun to go see a Bowl Game and to visit the University of Phoenix stadium, since neither of us has been there since we moved to Arizona. Since Matt's coworker was rooting for Baylor, we did, too! It wasn't very hard to feel an affinity for Baylor - the mascot is a bear and the opponent was a stuck up warrior... sound familiar? (The UCLA mascot is the Bruin Bear and that other team also has a silly warrior mascot!) 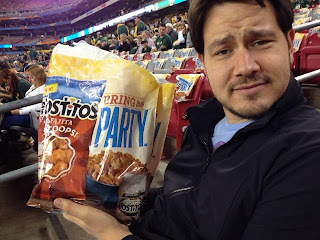 And since Tostidos sponsors the game, we ate TONS of free chips and salsa! 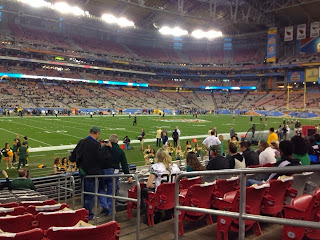 And our seats were excellent - 11th row from the field! Matt has been back at work, even on Saturday, working really hard. The company is having a big sales push through the end of the month, so I probably won't get to see much of his handsome face this week. Thursday I went out to Karaoke with Jennifer, a friend from my chorus, and had tons of fun! 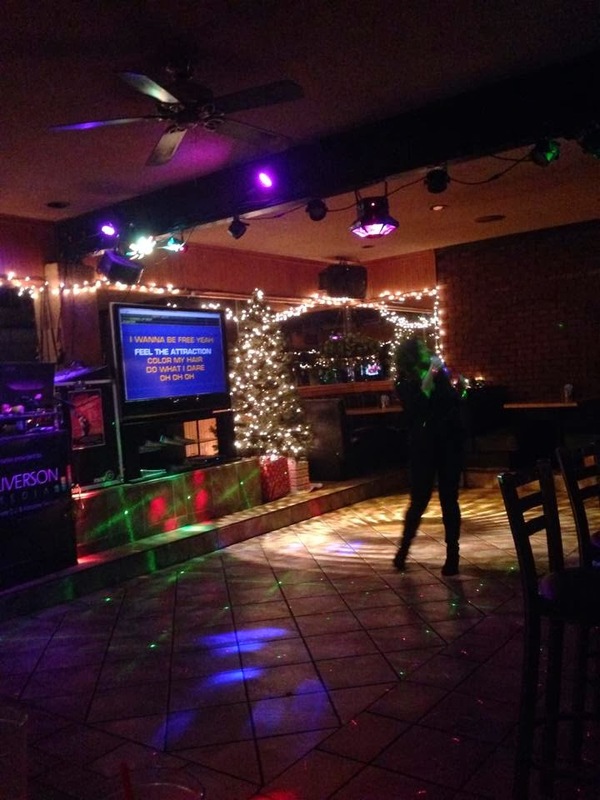 The place was pretty empty, so we got to sing several songs. I sang "Son of a Preacher Man" (my classic), "Man! I Feel Like a Woman" (because, I mean, why not? ), "Written In the Stars" as a duet with Jen (she even remembered the harmonies! ), and "I Have Nothing" by Whitney Houston (because what is Karaoke without the immortal Whitney?). Jen sang some Adele, "Life is a Highway", and one other song that I can no longer recall!! Friday I made some challah (sorry no photos!) and I even made an extra, so I put that one in the freezer to eat next Friday. I have never frozen bread before, so I hope it tastes good in a week! I wrapped in up in two layers of saran and another of foil, under the advisement of wiser bakers than myself. Yesterday, I got together for some singing while Matt took a day to read and relax after work. Today has been mostly about errands and getting ready to go back to "real life" tomorrow. I had back to work and should probably start exercising again! I twisted my knee skiing in Seattle, so I've been trying to take it easy. I did some yoga this week, but I'm gonna try for an easy run tomorrow and see what happens. Anyway, I know it's not too exciting, but it was winter break after all! I hope everyone else has enjoyed their time off (if you had it!) and has a good time getting back to work. I'll write more, soon!